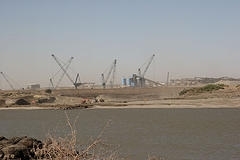 KHARTOUM, Jan 2 2012 (IPS) - The multi-billion dollar Merowe Dam on the Nile River more than doubled Sudan’s electricity supply, but its environmental impacts are still unknown to the public, and communities whose villages were flooded have not yet received compensation. The Merowe Dam, which was completed in 2010, will affect the aquatic ecology of the Nile River in Sudan by blocking fish migration and degrading water quality. It will also cause at least eight percent of Sudan’s annual share in the Nile Water Agreement to evaporate and will produce carbon dioxide and methane, two harmful greenhouse gases. “Sudanese people are unaware of the devastating environmental impact of the Merowe Dam,” said Ali Askouri, a human rights activist and the representative of the Hamdab Affected People, a group fighting for compensation and accountability for the populations affected by the dam, told IPS. No detailed study of the Merowe Dam impact on downstream communities has been published and Askouri is worried that when the effects become clear, it will be too late to take action. International Rivers estimates that at least 70,000 were displaced as a result of the Merowe Dam. In November, some 1,000 people hailing from the Manasir ethnic group, one of the groups displaced by the dam, took matters into their own hands and travelled close to the capital to hold a sit-in at Al Damar, the capital of River Nile State, about 300 km from Khartoum. Dam activists and international rights organisations prompted the European Centre for Constitutional and Human Rights (ECCHR) to look into the case and investigate the human impacts of the dam. "ECCHR started working on the case in 2009 after it was asked by other organisations to consider the legal responsibilities of the companies involved in building the dam," said Miriam Saage-Maasz, program manager for business and human rights at ECCHR. In May 2010, the ECCHR filed a complaint against the German company, Lahmeyer International, at the department of public prosecution in Frankfurt for human rights abuses due to the construction of the dam. The criminal complaint charged two Lahmeyer employees for knowingly flooding villages and causing displacement. The ECCHR states in their report that Lahmeyer was aware of the 2008 flooding caused by the dam and carried on with the project without building alternative houses for the affected families. In 2008, 30 villages inhabited by at least 4,700 families were flooded as a result of the dam. Years later, the Manasir have still not been compensated for their losses. In a statement issued by the Council responsible for organising the sit-in and protests, the protestors have asked the government to abide by their promises and provide them with housing and agricultural projects. Sudanese opposition parties have asked the government to take immediate action and meet the demands of the protestors as well as investigate the humanitarian situation in Kajbar and Amri, the site of two dams under construction. “No one knows what the impact will be on downstream communities, but from other similar projects, we can anticipate a catastrophic impact that may take some time to materialise,” Askouri told IPS. The Merowe Dam or Merowe Multi-Purpose Hydro Project is the largest contemporary hydropower project in Africa. Located in the town of Merowe in northern Sudan, its main aim is to provide electricity for Sudan’s growing population. Ahmed Saad*, who worked on one of the projects constructed for the Merowe community by the contractors, believes that the residents of the town are torn between appreciating the new positive changes the dam has brought to their community, through the construction of a hospital and schools, new services and the renovation of the university campus, and realising the negative impact the dam has had on their livelihoods. “People have complained that humidity from the dam’s lake has affected the production of dates, one of the important items in their diet and one of their main exports,” said Saad, who added that it rained in Merowe when he was there and rain is a very rare occurrence in that area. The residents of Merowe even started to observe the changes during the construction of the dam. Saad, who was stationed there for a few months, noted observations on fish output as it continued to dwindle and dryness in areas that were wet or flooded before the dam – a change that affected agriculture in the area. The dam was built on the Nile’s fourth cataract between 2003 and 2009 by Lahmeyer International, a German engineering consulting firm; two Chinese companies, China International Water and Electric Corp and Harbin Power Engineering Co; and the French energy company, Alstom. It was funded by the Sudanese government, China Export Import Bank and Arab banks and development organisations. Lahmeyer International, one of the contracting companies, was tasked with producing the Environmental Impact Assessment Report (EIAR) and the document was produced in April 2002. “The companies behind the Merowe Dam have never prepared a proper Environmental Impact Assessment Report, and the government has never published the shoddy study that was prepared,” stated Peter Bosshard, policy director at International Rivers Network (IRN). The IRN, an organisation that support sustainability and aims at stopping destructive dams while promoting environmentally-conscious water and energy solutions, has written about the environmental impacts of the Merowe Dam since 2005. In 2005, the international organisation received a copy of the confidential EIAR produced by Lahmeyer International and handed it over to EAWAG, the Swiss Federal Institute of Aquatic Science and Technology, to review. The review, published in 2006, revealed that the report does not follow World Bank or World Commission on Dams Guidelines on writing EIAR for dam projects. IRN then asked the contractors to suspend the project until further inquiry into the environmental impacts could be made. “The riverbanks are the most fertile grounds in the region, they are now flooded and new lakeshores are developing and due to the fluctuations in water levels, the lake shores are difficult to use for crop production,” Professor Bernhard Wehrli, who co-authored the EAWAG report, told IPS. He added that productive fisheries rely on stable riverbanks and lakeshores, and that fluctuations in water levels caused by the dam will harm the reproduction of fish and the growth of juvenile fish. The report brought up the Aswan High Dam of Egypt, also on the Nile River, as an example since it has been studied numerous times, and pointed out that the Merowe project’s EIAR did not mention the High Dam and did not look into steps taken to solve the growing environmental problems there. “The High Dam of Egypt revealed that there are serious consequences for the population and the life-support systems in the downstream part,” said Wehrli. The EAWAG team used their experience looking at dams in different countries, such as the High Dam, to assess the possible consequences of the Merowe Dam and suggest options to help minimise the environmental harm. “To preserve water in reservoirs, you minimise the surface area of a lake for an effective dam design. Also, the outlet to the turbines should be variable in order to use oxygen-rich water,” said Wehrli, adding that oxygen-rich water curbs serious harm to downstream fisheries and the deterioration of water quality. IRN calculates that the Merowe project will produce two harmful greenhouse gases, carbon dioxide and methane, when plant matter, algae and soil decompose. The dam’s production of greenhouse gases is equivalent to a natural gas project that generates the same amount of electricity. “African countries have a huge potential of renewable energy such as wind and solar, which in many cases is not more expensive than large dams,” Bosshard said. He added that government officials, corporations, financiers and bureaucrats continue to favour projects like big dams. “Such projects provide huge contracts, prestige, political control and often kickbacks under the table,” he said.